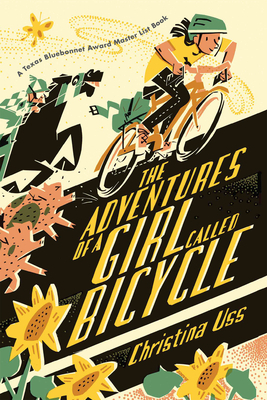 A determined 12-year-old girl bikes across the country in this quirky and charming debut middle grade novel. Introverted Bicycle has lived most of her life at the Mostly Silent Monastery in Washington, D.C. When her guardian, Sister Wanda, announces that Bicycle is going to attend a camp where she will learn to make friends, Bicycle says no way and sets off on her bike for San Francisco to meet her idol, a famous cyclist, certain he will be her first true friend. Who knew that a ghost would haunt her handlebars and that she would have to contend with bike-hating dogs, a bike-loving horse, bike-crushing pigs, and a mysterious lady dressed in black. Over the uphills and downhills of her journey, Bicycle discovers that friends are not such a bad thing to have after all, and that a dozen cookies really can solve most problems. A Junior Library Guild selection! CHRISTINA USS has written about bicycling and travel for many magazines and newspapers. The Adventures of a Girl Called Bicycle was inspired in part by her own experiences while biking across the United States, once widthwise and once lengthwise.